Hi Steve (and Janet), we are looking forward to your coming to Dubuque next week, Steve, for the mission at Nativity Parish and the Catholic Radio Event. Our little group of 7 accompanying you to the Holy Land almost a year ago—April, 2018 will all be there! The Holy Land Pilgrimage has all the earmarks of the Lord’s presence especially because the experience has only become richer as the time has passed rather than faded in memories. The Scriptures, the Mass, the Rosary are only richer for us. I had a particular experience I wanted to share with you. Right after Christmas, 2018, I had a sense that I was to draw close in Adoration of the Blessed Christ Child. I recalled being at the Church of the Nativity with you last Spring and when I came to the spot where the star was (place Jesus was born), I burst into tears. I did not see that coming and was somewhat embarrassed by it but now I realize that the Lord was preparing me for a strong Adoration of the Christ Child. That has continued. On the pilgrimage, I wondered if I should have gone because physical limitations made me think I was not too capable of making the trip and yet I remembered what Janet said that all on the Pilgrimage were supposed to be there and she (you both) had been praying for us. Now I certainly realize the truth of that even though (humorously) I can only remember going uphill to everything, I don’t remember coming down the hill at all! We have thought of you often and prayed for you and all traveling with you. Thank you for offering Pilgrimages for us! We hope all is well; God bless your travel here to Dubuque next week. Brian and I agree totally. We were just watching the video of our Holy Land trip with you last September, and it reaffirmed our commitment to return to the Holy Land again with you next year. It is something we will remember for the rest of our lives. We have been blessed to have traveled quite a bit in our life, but nothing can compare to the Holy Land, and I would not travel there with anyone else but you. And I am a travel agent and have many opportunities to travel with anyone I choose to go with. I have told many of my friends in our parish about your pilgrimages and encourage them to contact you so that they can have as wonderful and spiritual a journey as Brian and I did. God bless you and Janet. Hope to see you next year. We know you are most likely very busy preparing for your next Holy Land departure. It has been almost one week since our own return and the fruit of our Holy Land pilgrimage continues to manifest itself in our lives. As Deacon Steve has said, it was a trip of a lifetime. We each took away our own personal highs and many shared “couple” moments that we will remember in this lifetime and, God willing, take with us into the next. We know you must receive many compliments for the well-planned and thought-out pilgrimages you lead. And, we would be ones who would echo that! 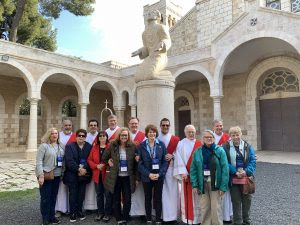 For us, we could see how invested you both are culturally, socially and spiritually with our brethren in the Holy Land making this pilgrimage seem very personal. Thank you for all you have done and continue to do to build up His kingdom. Our prayers are with you as you lead another group of God’s holy people. I have wanted, for quite a while now, to thank you both for the wonderful pilgrimage experience in Ireland. Aside from the always amazing sites, spiritual direction and fellowship, this time was very special because of the incredible opportunity that you all allowed for the “baby Deacons”, Tom and Floyd. Thank you so much for those special moments! It was also wonderful to see “old” friends whom we have met on previous pilgrimages, to meet new ones and to travel with wonderful friends. Traveling with you all is like family, thank you for making it possible for so many to experience these life altering moments. You are evangelization at it’s best! Thank you for all of your efforts, sacrifices and love for your faith as well as the enthusiasm to share it with everyone. 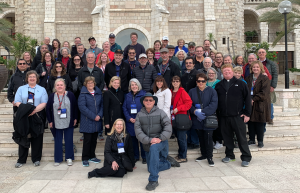 We are very grateful to have joined you on 4 pilgrimages and apparently, our enthusiasm is showing…2 couples from our Parish will be joining you this week in the Holy Land! I can only imagine how you all feel when you see the amazement in other’s eyes when they realize “where they are”! Again, thank you for making this possible for them and so many others. Have a wonderful, safe journey, you all are in our hearts and our prayers. Please give sweet Janet a hug for me!